Hello, i have a problem with my dog Bella. We live in miami FL. I already have an appointment with the Dermotologist for the next 2 weeks, they couldnt make an appointment sooner. But i need your help PLEASE, i need to know what i can do so that she doesnt get worse. 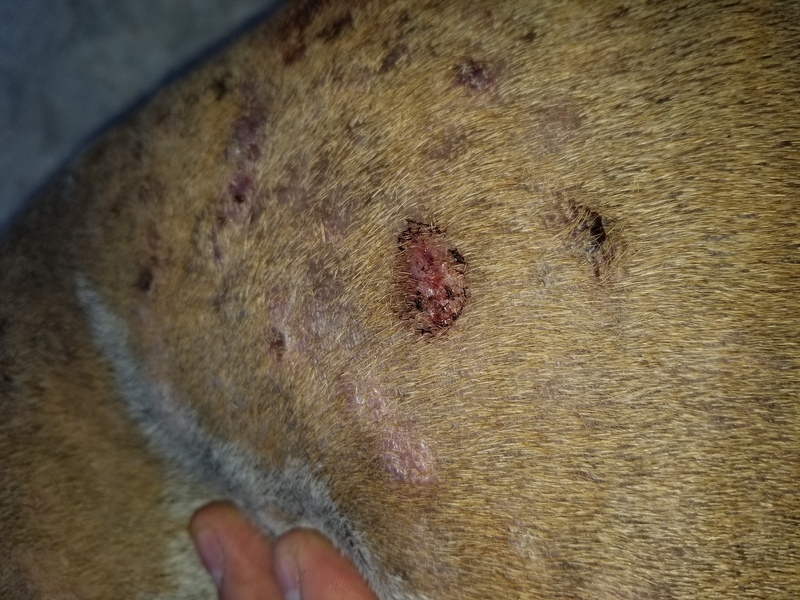 My dog is an American Bull dog, and she is having skin issues, a couple of Vets have already seen her and they say its an Allergic reaction. She doesnt itch at all, and she is bleading from the wounds... what can i do? I have changed her food, her shampoo, to the best possible brands that were adviced to me my those vets, and still nothing. I need her condition to get better or maintain where its at until we see the Dermotologist in the next 2 weeks. Pls HELP! Veterinarian's Assistant: I'll do all I can to help. What is the matter with your dog? Hello Dr. Meyer, i have a problem with my dog Bella. We live in miami FL. I already have an appointment with the Dermotologist for the next 2 weeks, they couldnt make an appointment sooner. But i need your help PLEASE, i need to know what i can do so that she doesnt get worse. 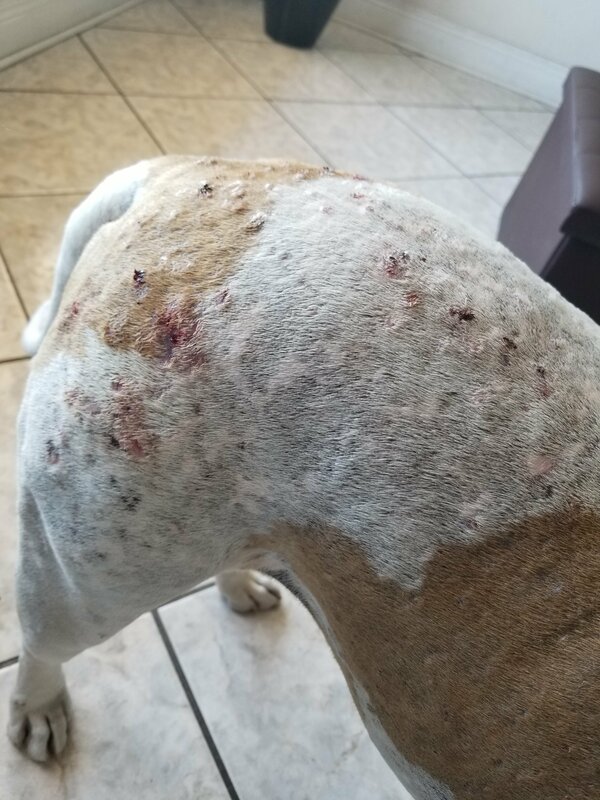 My dog is an American Bull dog, and she is having skin issues, a couple of Vets have already seen her and they say its an Allergic reaction. 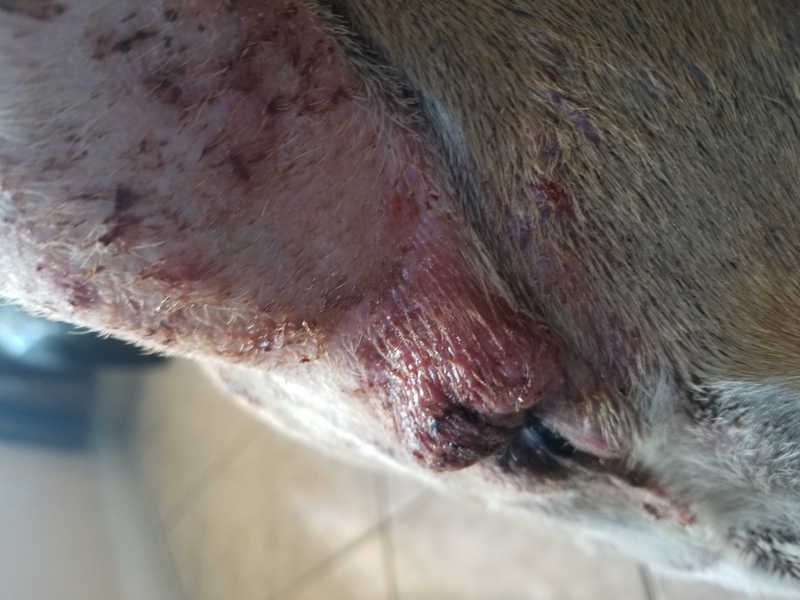 She doesnt itch at all, and she is bleading from the wounds... what can i do? I have changed her food, her shampoo, to the best possible brands that were adviced to me my those vets, and still nothing. I need her condition to get better or maintain where its at until we see the Dermotologist in the next 2 weeks. Pls HELP! Veterinarian's Assistant: Where does your dog seem to hurt? Veterinarian's Assistant: OK. What is the dog's name? Veterinarian's Assistant: Is there anything else important you think the Veterinarian should know about BELLA? Hi, this is Dr. Thompson. I’ve been a small animal veterinarian since 2000. Thanks for your question. I understand your dog Bella has skin lesions you are concerned about. Is that correct?